Recently, Gourmet Live published a list of the 50 most influential women in food or "game changers" as they called them. While I think most of these women deserve their place on the list; I must admit when I first read the list I was a little bothered (I take this stuff way too seriously)! They left out some of the most creative, talented women in food. They chose Ree Drumond, who is a very successful blogger, and Julie Powers, who cooked through Julia Childs cookbook, over Marion Cunningham, who edited and rewrote the Fannie Farmer cookbook. Learn more here! And what about Dorie Greenspan? I cook with her on French Fridays! She's written some amazing cookbooks. Not to mention Clementine Paddleford! Her book How America Eats was considered groundbreaking in 1960, but now mostly unknown and out of print. Read more here about Clementine! Or what about Rose Levy Berenbaum, a baking genius! While Ree has a wonderful blog, her cooking is very basic and for me does not qualify her to be on this list. Julie's blog certainly inspiered many woman to start blogs themselves, but again a game changer...I don't think so. I just think so many really prominent women were left out. Was it because they chose women on their popularity or is it more that the editors of Gourmet are not quite up on their culinary history? I'll never know…agree or disagree it's the list! Last week, as I was browsing some of my favorite blogs, I came across Mary of OnePerfectBite. Her idea was to cook her way through each of these 50 women, one each week! I thought it sounded like fun so here I am with # 6 Marcella Hazan. She is an Italian food writer who writes in English. Her cookbooks have introduced people, in the United States, to the techniques of traditional Italian cooking. She is widely considered by many in the food industry to be one of the foremost authorities on Italian cuisine. Since it is very warm in my part of the country, I decided on Marcella's Semifreddo di Cioccolato. Semifreddo is a very traditional Italian dessert. It means half cold and is a class of semi-frozen desserts. It is the texture of frozen mousse. This recipe was so easy and absolutely delicious! A wonderful dessert for a hot evening! Whip the cream. Before it begins to stiffen and while it is still the consistency of buttermilk, add the confectioners’ sugar a little at a time and continue whipping. Beat the egg whites until they are stiff but not dry; fold them into the cream and chocolate mixture. (Because the egg whites are not cooked I bought pasteurized eggs). 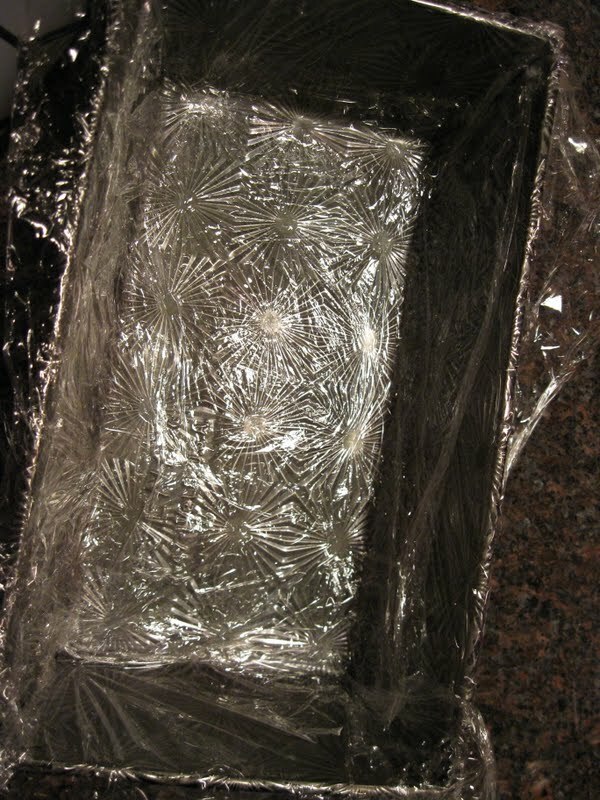 Line a loaf pan of 1½ to 2 quarts with wax paper and pour the mixture into the pan. 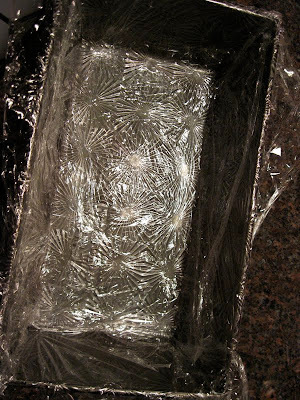 Cover with plastic wrap and freeze overnight. To serve, unmold the loaf onto a platter, remove wax paper and slice. Please visit these other wonderful blogs and see how they chose to honor Marcella Hazan. If you would like to participate with this group visit Mary at One Perfect Bite. What a delicious looking dessert! I'm glad we have one of these to balance out all of our entrees and healthy vegetable dishes. And I'm glad you'll be joining us to cook dishes from these fantastic women! This looks amazing Kathleen and is the perfect ending for our love affair with Marcella Hazan. Well, the list is definitely controversial...and I don't necessarily agree with every pick...but from a neutral point of view, I do think every woman is on that list for a reason. Some got the shaft, but so is life... Thankfully I totally agree w/ Marcella Hazan (genius). Your semifreddo looks so light and fluffy and absolutely mouthwatering...I want to dig in! great post, i am totally with you on that some inspiring women have been left out (maybe we should do a private mini-tribute to dorie greenspan!). and thanks for sharing that semifreddo recipe, yey to a dessert dish! You know, I grew up in Italy & have lots of Italian cookbooks & I've never even heard of Marcella Hazan! I think it's more of a popularity contest, as you said. I think Mary Ann Esposito should have a place on the list, too! You're right, we're being too serious. It's like the most beautiful people awards - it's all so subjective! But what a fun adventure & great group of bloggers! Of a list of only 50 and how many chefs around the world? We are bound to miss a few. But with that said, your dessert looks fabulous, and I want to try it now! Hmm...I've been on an ice cream kick for so long, I'm ashamed that I haven't tried a homemade semifreddo. This looks great! What a perfect dessert for a warm summer evening! That's what I love about Marcella Hazan's approach to food ... a few basic ingredients that make a wonderful taste experience and can be dressed up or down, depending on the mood and pantry contents. Welcome to the group doing this blogging share! Hi! Your semifreddo recipe was nominated as one of the "Best 300 Semifreddo Recipes on the Net". To vote for it, please visit http://easyitalianrecipes.org/dessert-recipes/best-300-italian-semifreddo-recipes-on-the-net-vote-for-your-favorite/ - your recipe is positioned at #158 (random order).